A custom car is a labour of love, and there is nothing like the satisfaction you get when your project is completed and your pride and joy is ready to turn heads. But if the worst should happen, it is important to have the best possible custom car insurance in place. So whether you are into street rods, custom vans, hot rods or custom cars, Fords, VeeDubs or American muscle, a specialist insurance broker should be your first port of call. Adrian Flux has over 40 years experience in arranging insurance for every car conceivable, including customs ranging from one-off classic replicas or classic street cars through to utterly bonkers and unique creations. If it is legal, then we will tailor a custom car policy that is every bit as unique as your vehicle. We know that owners of custom car owners are not run of the mill motorists and the customised cover we arrange takes this into account. Members of most custom car owners clubs and forums can also benefit from discounts of up to 15%. 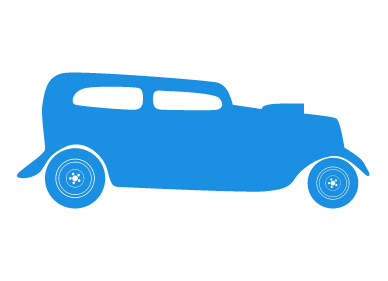 What constitutes a custom car or street rod can sometimes be a matter for dispute, but you will find that we have a broader definition than most of our competitors. We can arrange great cover whether your car is a 1940s Ford, a '63 Chevy or even a motorised sofa. Agreed value cover many insurers will only pay out the 'market value' of your custom car if you suffer a total loss. We can assess your car and agree cover for its true value, so you won't get a nasty surprise if you need to make a claim. Laid up policies so classic projects are fully protected from theft or mishap. Limited Mileage discounts the fewer miles you drive, the more you can save, from as little as 1,500 miles. Because custom cars tend not to be driven every day, most schemes incorporate a limited mileage element. Unlike many of our competitors, however, we can also offer insurance for people who use their custom on a daily basis. Wedding Hire cover can be arranged on application. Track Day / Rally cover can be arranged on application, depending on the policy taken. Owner's Club Discounts If you belong to a recognised classic car owners club or enthusiasts' forum, you will receive a discount of up to 15%, depending on the policy taken. Quicker & Cheaper rates by phone, please complete the call me form during office hours 9am to 7pm Monday to Friday & 9am to 4pm Saturday for an immediate hot rod insurance quote.